Searching for ideas on how to create an understated, modern abode within a limited floorpan? Look no further, because Castroferro Arquitectos, creators of this wonderfully relaxed and inviting Spanish home, have got you covered. 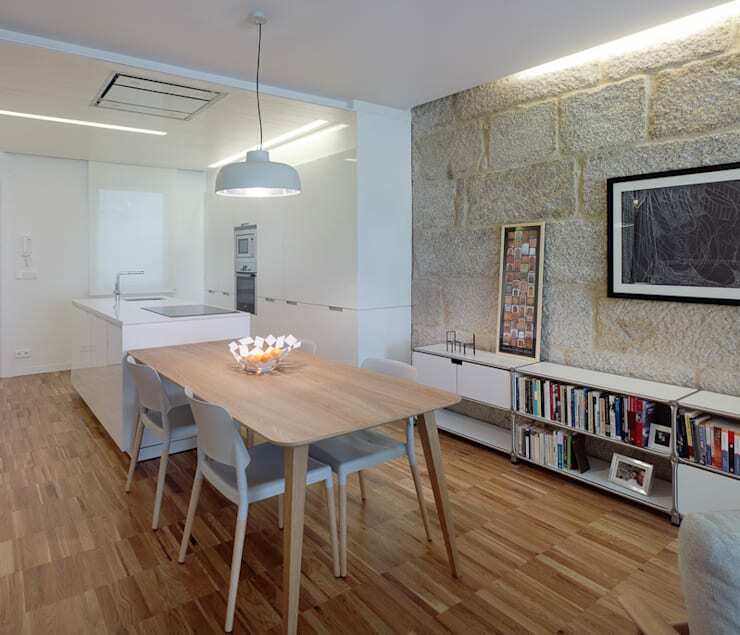 The commission in question has been designed within a 70m2 apartment, and combines a range of stylistic elements to create a modern dwelling that carefully balances sophisticated elegance with casual appeal. Upon entry we're immediately embraced by a range of impressive design features and construction materials, with wooden flooring and white decor framing a bold, stone feature wall, which infuses the home with a sense of history and tradition. The furnishings throughout are modern and comfortable, with stylish, contemporary designs featured prominently. The home also hosts a range of functional elements however, adding to its appeal within the confines of a relatively small space. Flowing bookshelves line the walls of the dining and living area, while a beautifully constructed bed head provides bedroom storage, and a dais upon which to display a range of contemporary artworks. Take a tour below and gain some ideas and inspiration on how to make the most of your own apartment! The interior of this lovely home blends a range of subtle styles to create a sophisticated, modern atmosphere comprising wood, white and stone finishes and simple, stylish furnishings. 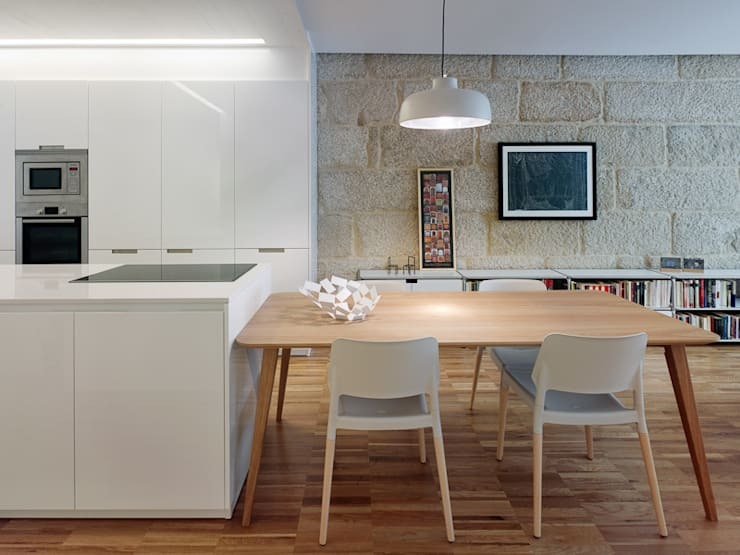 The kitchen and dining areas join seamlessly, with a minimalistic, wooden table flowing on from the sleek, white kitchen space. Wood panels also line the floor, with speckled parquetry creating a natural pattern underfoot. In the distance we can see the rough surface of a strong, stone wall, adding a sense of history and tradition within the home, as well as a contrasting textural element. This vantage highlights the sense of flow within the kitchen and dining areas of the home, with the transition in decor providing the primary delineation between each space. The kitchen is compact, contemporary and bathed in white, with a kitchen island and ample cabinet space providing plenty of storage options to maintain the room's streamlined appeal The dining area charms the space with its minimalistic elegance, while a generous stretch of shelving flows behind, nestled against the cool stone of the far wall and filled with plenty of colour and character. Adjoining the kitchen and dining areas is this light-filled and relaxing living space, housing a range of contemporary couches and chairs, each bathed in sunlight flowing through the room's large window. The couches surround a park bench-style coffee table, with each artfully designed furnishing adding a degree of sophistication within the room. 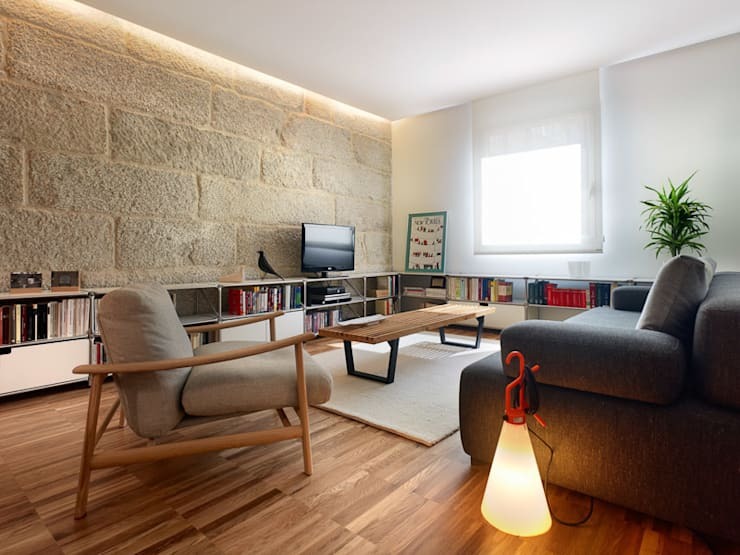 Here we can also see that the flowing bookshelves border the entirety of the living and dining rooms, running against the length of the stone wall and beneath the living room window. These not only provide functional storage, but also host an array of decorative objects, further highlighting the personal character and style of the occupants. 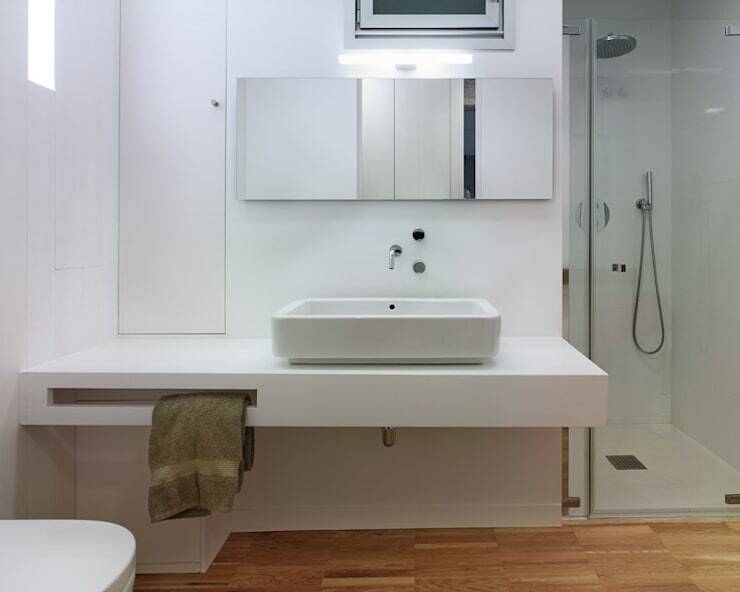 The bathroom within the home showcases the classic combination of wooden flooring and white decor, with its pristine walls and sink units complementing the sheen of glass and mirror. The sink and shower units are once again simple yet stylish, with the entire space emitting an air of relaxed, understated sophistication. The master bedroom presents another cosy and inviting space, with the contrast of materials within its design particularly evident. The strength of grey stone provides a bold, rustic backdrop to the modern wooden flooring and furnishings, while a beautifully constructed, contemporary bed head draws focus within the room. 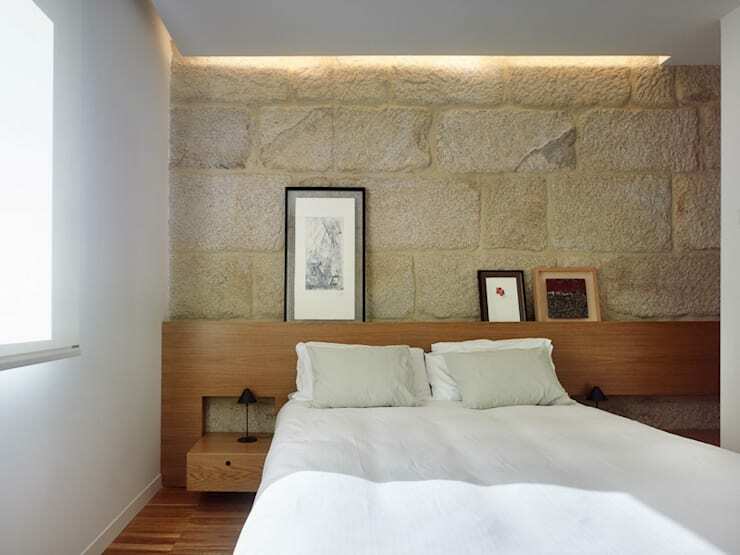 The crisp, white linen of a voluminous bed contrasts beautifully against the rough stone wall behind, as the entire room brims with comfort and understated, modern elegance. Did you like the beautiful parquetry flowing throughout this lovely home? Take a look at How to take care of wooden floors: 6 tips to do it right for ideas on how to augment your own floorboard. Would you like to live in this lovely, Spanish home? Tell us what you thought below!